Coming soon to 19 more cities! The Copyright Act of 1976 gives a copyright owner the “exclusive righ[t]” to “perform the copyrighted work publicly.” 17 U.S.C. §106(4). The Act’s Transmit Clause defines that exclusive right to include the right to “transmit or otherwise communicate a performance . . . of the [copyrighted] work . . . to the public, by means of any device or process, whether the members of the public capable of receiving the performance . . . receive it in the same place or in separate places and at the same time or at different times.” §101. I submit that Aereo failed because they didn’t stick with what they were for in the first place. Instead they decided to ride the “cloud” buzz, which confused the offering first and the Court second. To understand how they might have won, you need some background. Before the ’76 law, cable was called CATV, for Community Antenna TeleVision. 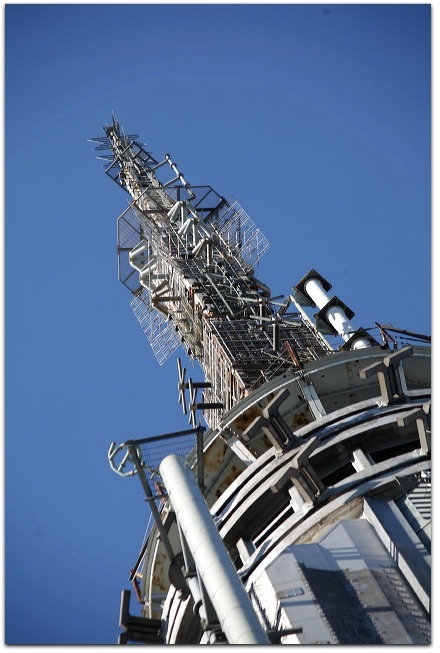 CATV answered the market’s need for clear signals where reception of over-the-air signals was poor or absent. But once “cable networks” (TBS, HBO, ESPN, etc.) showed up, and it was obvious that the handful of legacy broadcast networks (ABC, CBS, NBC, PBS, Univision) would be outnumbered by new cable networks, those networks (and their programming sources) wanted to be paid by these new distributors, who were charging customers for retailing their goods (legally, “performances”). The ’76 law gave them leverage to force those payments. Over-the-air (OTA) TV was still available for anybody to receive for free using an antenna, of course. But this was a legacy grace — an exception to the rule of closed distribution through cable and satellite. But the distinction was clear. Cable and satellite were Pay TV, and OTA was Free TV. The selection of free signals was (and remains) relatively small, but not much smaller than “basic” cable. Arlington, VA – 07/30/2013 – New research released today from the Consumer Electronics Association (CEA) ® found that just seven percent of American TV households rely solely on an antenna for their television programming. The findings of the new study, U.S. Household Television Usage Update, are consistent with CEA’s 2010 research which found eight percent of TV households reported using an antenna only for television programming. According to historical CEA research, there has been a gradual decline in the percentage of TV households using antennas since 2005. The phone survey of 1,009 U.S. adults is comparable to a 2012 Nielsen study indicating nine percent of all U.S. TV households are broadcast TV/over-the-air only, a decrease from 16 percent in 2003. One reason for this is simply that there are more channels on cable than over the air. The other reason — the one that matters to Aereo — is that free TV reception nearly went away, thanks to the FCC’s mandated transition of OTA TV from analog to digital (DTV) transmission, which finished in June 2009. For TV viewers, the DTV transition required new equipment to receive signals that were much harder to get. If you lived in any place shadowed from direct line-of-sight to signal sources, you were out of luck. In the analog era, you could get signals with rabbit ears and a loop or a bowtie antenna on your TV, if you lived in an urban or suburban area. The pictures might have “snow” or “ghosts,” but you could see them. If you lived in an outlying suburb or a rural area, you would need a rooftop antenna. But DTV was much harder to get, and lots of people gave up and went to cable or just bailed from the whole thing. This is hokum. You’re not getting the signal without a good antenna, ideally placed, and even then your odds were short, because conditions need to be ideal. The simple fact is that the DTV transition left millions of free TV viewers in the lurch — and that lurch was Aereo’s market. So here’s my point: There would have been no Aereo without the DTV transition. Go to that last link and type in this zip code: 10040. It’s in the north end of Manhattan, where I am temporarily domiciled. You’ll get back a chart showing eleven strong signals, four moderate ones, and four weak ones. Our apartment is in that zip code, and we get nothing. Zip. Even with a directional outdoor antenna. Believe me, I’ve tried. There are a hundred blocks of buildings and terrain between us and the Empire State Building. If we want local over the air (OTA) TV, our only choice is — or was — Aereo. By serving urban areas that got shafted by the DTV transition, Aereo is a perfect example of the marketplace at work: supply fulfilling demand. That should have been their case. He’s kidding himself. OTA reception may be “meaningful” for 60 million Americans, but most of those people don’t care any more. And neither do today’s TV content production and distribution systems, which include far more than Hollywood and the broadcast/cable/satellite TV industries. They include you and me. Still, some number of millions of people do care, and can’t get the free OTA signals they used to get in the analog age. That was Aereo’s market, and now that market is back in the lurch, probably permanently. Positioned over-the-air transmission as little other than a checkbox requirement for stations to maintain “must carry” status with cable systems. Since these signals are expensive to maintain, it’s a matter of time before they go down with the setting sun. This will require regulatory easing (for example, by maintaining “must carry” in the absence of an actual signal, which is already partially the case anyway, since the signals have been lost to a great many people). Watch for that to happen in the next few years. Finished positioning cable as simply a paid distribution system for licensed content. The legal and historical connections to Community Antenna TV are now completely severed. To TV’s sources and distributors, Pay TV is the Only TV. The legal case I outlined above would also have been stronger if Aereo had stuck with its original business case: charging viewers for access to their own antenna — not in “the cloud,” but in the physical world, looking directly at the signal source. If Aereo had then provided apps on the receiving side (for tuning and recording), they would have been in a much better position, at least conceptually. The Supreme Court understands demand and supply. If Aereo had said, “We’re only serving over-the-air TV viewers who lost their signals in the DTV transition,” the decision would have been framed as one between standing law and market demand. The Court might still have decided in favor of the law, but it would have been clear to them that market demand was in play. But Aereo clouded their case, literally. So the Supremes fell back on what they understood, which was the ’76 law. Did “the cloud” take collateral damage? Could be. We’ll see. Bonus link, with prophesy: TV 3.0. I strongly suspect that darknet connections are all we’re going to have left in a few years for getting non-filtered, non-tracked flows of “content”, now that broadcast is dead. If you want to be able to share content in the future, now is the time to stock up on USB sticks and devices which can boot from a stick, never need internet, and can read/write other sticks, like reasonably new laptops. Mike, I don’t grant our overlords that much power. Or malice. The pendulum has swung to the max in the centralized/mass-market/controlled direction. It’s starting to swing back. I disagree with some of your assertions about OTA TV reception. Yes, for many it may be more difficult to receive now compared to analog TV transmission because of the characteristic known as the “cliff effect” which essentially means all-or-nothing or if the quality of the received bit stream is not consistent then the “all” is intermittent. That is because in many cases the reception is similar to cell phone reception. Moving the antenna just a few degrees in direction, height, or position can make the all-or-nothing difference. That applies to indoor as well as outdoor antennas. So you are right in that some people simply gave up but that is because they did not follow the FCC’s instructions about how to receive digital television by experimenting with the antenna placement. On the other hand, people far away from good strong reception to the extent that it was not worth watching analog TV or there was virtually no picture at all, now with the proper antenna or even their existing antenna, they can receive a perfect high definition picture. So these added viewers offset some of the lost viewers. I suspect that in your situation where you are there was no analog reception either, probably because of the severe multipath (reflected signals) with all the surrounding buildings. I was an early adopter of DTV in San Francisco and the surrounding Bay Area since 2000 (the local PBS even station gave me an antenna to test) and my findings about antennas and reception were published in Consumer Reports and eventually they wound up on the FCC website. Bruce, it isn’t just the cliff effect. Second, the FCC’s instructions — put a directional antenna 30 feet above the ground — was also useless in many cases. Take our home in Santa Barbara, for example. In the Analog Age, our directional rotating rooftop antenna picked up good signals from every VHF, and most UHF, stations from Ventura to Tijuana, including everything from Los Angeles, Orange County and San Diego. After the DTV transition, all of them were gone, except for the San Diego/Tijuana stations, which come in about 10% of the time. For examples of those, and the “cliff effect” at work, look at this photo set or this one. This was in 2007, after the transition started, and all the San Diego stations had made the switch. The best signal of those was KGTV, which goes by Channel 10 but was then actually on Channel 28, as I recall. Since then they’ve moved to the real Channel 10 on VHF, and we can’t get them any more. We also can’t get KEYT, our local Channel 3 in Santa Barbara. Back when it actually radiated on Channel 3, we could get it clearly on rabbit ears, and didn’t even need the rooftop antenna. Now it’s on UHF channel 27. A slight bit of terrain shadowing keeps us from getting it, despite its power of 699kw. The old signal came from the same location, atop 4000-foot Broadcast Peak, with just 100kw. While we got the New York apartment after the DTV transition, I’ve tried receiving DTV signals in many locations, using an EyeTV Hybrid, with a directional antenna, on my laptop. It’s a good receiving system. When the site can see the Empire State Building, reception is fine. When there’s no clear sight, forget it. The receiver says the signal strength is strong, but the signal quality is low. That’s because digital signals degrade much more poorly. Cliff effect again. Another case in point: Atlanta. Check out this photo set, taken from the Westin Peachtree, where I had a room on the west side of the 59th floor. Within several miles on the east side of the hotel were the transmitters of all Atlanta’s TV stations. With my laptop’s receiver I could get signals from all of them, but pictures from none, because shadowing by the hotel destroyed the signal quality. To the west, however, I got lots of stations, though most of those were still analog. One was a Georgia Public TV station about 80 miles away that happened to be shutting down its analog transmission that very night. You can see the recording here (with the sound killed by Google because it featured copyrighted music: Ray Charles’ “Georgia on my Mind”). I couldn’t get the new DTV signal. Both were on UHF. I could go on. The simple fact is that the promise of DTV was met in only one way: Digital looked and sounded better than analog. For coverage and tolerance of less-than-ideal signals by receivers, analog won, big time. Mr. Searls, maybe some of the following might help you. Thanks for your thoughtful reply. However, I suspect you still don’t quite grasp how critical antenna placement is for your Santa Barbara site and that is in the FCC instructions for indoor antennas which in the early years were borrowed from my writing. If they have not used the same method for outdoor antennas then they are irresponsible. In fact, prior to the analog turn-off the FCC was negligent in informing the public (and the antenna manufacturers) that about 10% of the stations in all the major markets would eventually still be on VHF high band after the analog turnoff. I became aware of that only after an antenna dealer in Illinois blew the whistle on it on his website and prior to that all of the antennas that were sold and advertised as being specifically for DTV were UHF-only. I learned early on about the difference between virtual and actual RF channels and the temporary assignment that many stations got when they were simultaneously transmitting digital and analog before the analog turnoff. In the San Francisco Bay area it took many months, (maybe a year?) for the TV stations on Sutro Tower to get their permanent DTV transmission antennas and it changed the propagation patterns again compared to when they were simulcasting. Your anecdote about your experience in Santa Barbara is typical. People who had both indoor and outdoor antennas for analog TV assumed that they should also be able to receive the digital signals and that is where things went wrong. The propagation, especially over long distances and over various terrain and vegetation, makes for very quirky reception. It is literally about precise location and orientation of the antenna. Moving an indoor antenna just a few inches or outdoor antenna just a few feet can be all-or-nothing. From what you wrote I assume you did not try moving your roof antenna in Santa Barbara. I will bet with a very good probability of winning that I can find usable DTV signals from most of your old stations. The key to success is trial and error and lengthy experimentation. When I had my antennas on my single-story home on the roof pointing west to receive San Francisco, I could only receive the RF UHF signals on one end of the house and the RF VHF on the other end. And the rule that higher is better is not always true, either. In some cases a high antenna will not receive a signal but if you lower it 2 or 3 feet you do. In my experience on the border of Pleasant Hill and Concord (at an elevation of 58 feet about 28 miles from San Francisco’s Sutro Tower) I find it is easier to receive UHF over long distances than VHF from Sacramento, San Jose, Rohnert Park (north of the Golden Gate) and San Francisco. And indoors I can get a few UHF stations but none of the VHF ones. At one time I had five antennas on my gently peaked single-story roof in different spots for San Francisco and Sacramento and one UHF-only on my patio pointing south for San Jose. All of the roof antennas were on temporary moveable mounts but my house was accidentally inspected by a state inspector (my address is number 3 and she was supposed to inspect number 33) and I had to move them all onto my patio where they remain today because of the cost to have them permanently mounted and also the fact that I am now nearly 70 and not as nimble. My reception is good about 95% of the time because it varies with weather conditions and the time of day when I will have some some very brief intermittent episodes, about two seconds or so. It was close to 100% when the antennas were on the roof. I have tested the biggest combined UHF and VHF antennas and for long distance DTV reception none can perform as well as separate units, and not just because sometimes separate locations are necessary because of the nature of the wave propagation of UHF and VHF. Later I learned from “DXer” websites that this has been true since the beginning of UHF TV transmission. I use two models of the highest gain yagi-type (long, highly directional) antennas with mast-mounted preamps. The low-cost Winegard YA 1713 for high band VHF is now discontinued. I just checked and there is a new-in-box one on eBay for $80 shipped, over twice the price when they were in stock. There are only a few VHF-only ones now on the US market but they are not nearly as long and high gain as the Winegard YA 1713. Some DXer websites talk of big models available in Canada and Europe and photos of their monsters may even be ones that are homemade. I was able to successfully combine the UHF and VHF antenna signals from the same direction inside the house with the proper UHF/VHF combiner. But combining the antennas from different directions caused interference and did not work. For UHF I use the Terrestrial “Digital” 91xG which has been copied by a few other brand manufacturers (importers, really) and I think even high-volume antenna dealer Solid Signal has one under their name and they also sell the one that RadioShack has. Another factor in the digital transition was that the first generations of ATSC tuners were terrible, especially with multipath problems. The last I heard we are on about the fourth-generation and the fifth one was perfected by Samsung but I read that they refused to license their circuitry to other manufacturers. My worst tuner is in my 2005 model 42-inch Panasonic plasma TV. My first receiver was the RCA (Thompson) DTC–100. In 2002 my San Francisco neighbor hired old-school analog TV antenna professional installers to put up a UHF antenna to receive Sacramento HD because NBC had departed from KRON in San Francisco. They went up on the roof with their antenna and a spectrum analyzer and announced that there was no usable reception from Sacramento, even though the analog channels were still on the air. My friend and I went up and spent about an hour and a half with my DTC 100 and we found the sweet spot which we marked and called the installers back and he got all of the digital channels from Sacramento. That year the chief engineer of our PBS station (KQED) gave me the Silver Sensor, the so-called “HDTV” indoor UHF “arrow” type antenna from England to do tests and I wound up receiving NBC HDTV about 100 miles from Sacramento with the little antenna under my bed! My preferred ATSC tuner for testing is in a digital-to-analog converter, the Zinwell ZAT-970A. It has an excellent dual signal meter, the usual one for strength and, more importantly, one for signal quality. For years I was baffled by situations where I would have a full-strength indication on single meters and yet get intermittent reception. After I got the Zinwell and started adjusting also for quality then I really was able to get good results. In the Installation function it also has Manual Scan for a selected single channel but you must know the RF channel (or frequency, it has that mode, too) not the virtual channel number to use it. The signal meters stay on until cleared, which is ideal for antenna orientation. The older channel master and Winegard preamplifiers had separate VHF and UHF modes or some models were UHF only or VHF only. An English company makes super low noise preamps that cost several hundred dollars imported and they claim they are good for week reception and they are used by DXers. The above link is pretty old and I kept getting errors in Safari but I was finally able to get it after several tries in the Chrome browser. This is also why it is not a good idea to have amplified antennas indoors because in some cases they amplify the interfering noise. My preferred small antenna for initial testing is the unamplified Terk model based on the Silver Sensor UHF design but it also has fold-down rods for VHF. Here is the link to the Zinwell converter on Amazon but I notice that some sellers have a completely redesigned unit but with the 970A model number instead of 950A and a new higher price. The new version has a metal case and internal power supply and AC cord whereas the old one is all plastic and has a 5 V DC wall wart. If you want, I will send you one of my used ones for $40. Bruce, thanks for your long replies. In Santa Barbara I’m using the Winegard HD9032 antenna for UHF and a Jerrold (can’t find the model number) for high-band VHF. Simply put, the signals aren’t there, except for the San Diego/Tijuana ones, when the weather is right. (Technically speaking, when the capacitive properties of the air between the transmitting and receiving antennas to provide some tropospheric ducting as the DXers put it.) The antennas are on a rotator and I’ve moved them around quite a bit to seek out signals. The roof below them is copper, and the site is well away from sources of electrical interference. A satellite TV antenna (Dish) is also on the roof nearby and has no trouble. So I know a lot about this stuff. Oh, and I also have the same Terk antenna you recommend, and use it to detect the presence of signals. It worked great where we lived near Boston, and could “see” the Needham TV antenna farm through the trees. It detects exactly nothing at the Manhattan apartment, indoors or on the roof, because our apartment is just 3 floors high, and our “view” toward the Empire State Building is through a wall of brick many floors high, plus many other buildings on the other side of that one. Anyway, you make my point: DTV signals are relatively hard to get for most people (the ones unlike you and me, who go to the trouble), and that was the market Aereo operated in.